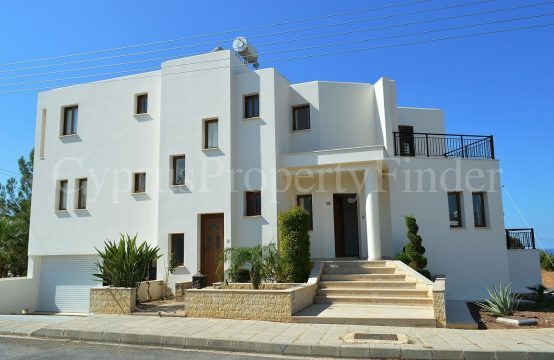 This most Spacious Three Bedroom Detached Villa is situated in a quiet cul-de-sac location, within a small development of individual villas in Saint George. It is about a ten minute walk to various restaurants, and about a twenty minute walk to the picturesque harbor, where you can enjoy stunning views of the Mediterranean coastline and the national park of the Akamas Peninsular. This Property was built several years ago, and has been extremely well maintained by its current owners. The surrounding Gardens have been beautifully landscaped with lawns, fruit trees and shrubs. The Property is approached via double wrought iron gates and Driveway, and the Main Entrance is to the side. On entering into the Hallway, you feel an air of open plan space, yet the rooms have been sectioned off with archway features. To the left is the under Stairs Cupboard and Guest Cloakroom, and to the right is Large Open Plan Kitchen with fitted wall and base units. Ahead of the hallway is the Large Living/Dining room, and from both side there are sliding patio doors that lead out to a Covered Veranda and Private Swimming Pool. On the First Floor there are Three Double Bedrooms all with fitted wardrobes. The Master Bedroom also has an En-Suite, and the second and third bedrooms share a Family Bathroom. The master and second bedroom have the use of a shared Full Length Balcony, where you can enjoy the natural surrounds and some Sea Views. All White Goods are included in the sale price, and Furniture is available by negotiation. This Property has been realistically priced for a quick sale.